Since Clinique introduced their Chubby Sticks, alot of make-up brands have caught on to the hype and released their own version of lip crayons. 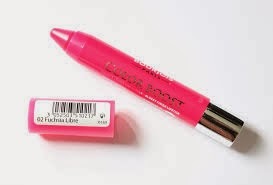 Not being able to afford anything Clinique, ever, I had my eye on the Bourjois lip crayon for a while. When I had the bit of extra money, I treated myself to it. I also got the Boujois cream blush, which I reviewed here, and I got a free make up bag with that, bonus. 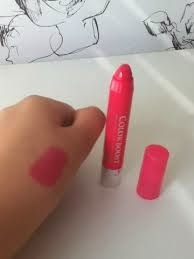 Truth be told, in the chemist, I swatched the Clinique Chubby Sticks and I really preferred the formula of the Bourjois Lip Crayon, it seemed less sticky and more pigmented, and obviously more wallet friendly. I decided to go for the shade Fuchsia Libre, a vibrant pink, I think it makes a gorgeous lip colour for special occasions, like weddings or christenings, or if you are feeling quite girly. I have most dark lip colours, and I thought this would make a pleasant change. I really love this lip crayon! I love the formula, not sticky, gloopy or drying and it feels light on the lips. It's really pigmented and it really suits my skin tone. 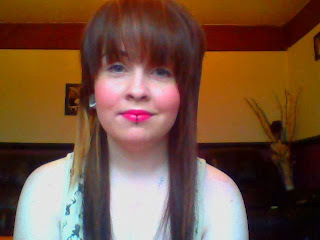 I think those pinks suits the paler girls and I was really happy it didn't make me look clown like. I'm not a huge fan of pink make-up, but I love this alot. I have chronic sore lips, a few hours without Vaseline, my lips will be very sore, so before I put any make-up on, I put on Vaseline first under my lipstick. this lip crayon ''ensures comfort and hydration for 10 hours''. The colour also claims to last for ten hours aswell. I have to say, that this is a really hydrating and moisturising crayon, so I don't have to apply Vaseline as much, which is a huge factor for me, but the glossy effect doesn't last for ten hours, maybe two hours, but if you reapply, it's grand. The colour also doesn't last for ten hours either, I always take the estimated time that it will last on the packaging with a pinch of salt, it's always an exaggeration, but I knew it wouldn't last so long, I mean come on, our lips go through alot in a day, talking, eating, what have you. ;) At a stretch, it lasts six hours, which isn't bad at all! It claims to be waterproof aswell, which I found to be quite true, so far. I'll get to test that when it's beach weather, which should be aaany day now. *ahem*. Another huge plus with this lip crayon is the added SPF 15! You think you wouldn't need it in this weather, but the harsh cold winds can burn or dry out your lips, and this stops that from happening, making it suitable for Winter time. The first time I used this, it was quite hard feeling to apply, but once you use it, it's super nice and easy to glide on. As the pigment is great. you only need one coat. The texture is nice and creamy and silky, It feels soft and hydrating as you apply it.